A dog park is not your typical place to find love, especially if you don't even own a pooch. But that does not deter Ralph Bellini by one dog biscuit. Ralph is a little late arriving at courtship's door but it doesn't stop him from actively pursuing his heart's desire: a woman of a certain age who has a little "furry rat" at the end of a leash. Ralph may have reached the ripe old age of eighty but he is young at heart and ready to greet love head on. Anything but an ordinary suitor, he uses operatic arias to woo his lady. No pink roses or milk chocolate caramels for this guy. Thanks to playwright Joe DiPietro, you are cordially invited to witness the pursuit of Carol and her pooch Peaches in "The Last Romance" a bittersweet tale of love in later life, enjoying a walk in the park at Connecticut Cabaret Theatre in Berlin weekends until Saturday, February 3. For years Ralph, a spry and talkative George Lombardo, never varies his routine. One day he does and his life changes. For the last twelve years, since his his wife Anna died, Ralph has walked the same streets at the same time and met the same people. Today, he tried a new route in a new direction and voila! he sees a lovely lady he wants to know more about. He follows her to the dog park and asks her not her name or the name of her terrier but "Do you like opera?" Long ago Ralph had dreams of becoming an opera singer and performing at the Metropolitan, and he even auditioned for a role. Even today, opera is a major part of his world and he wants Carol, a stand offish and proper Barbara Horan, to enroll as a student in his Opera 101 class. Since his wife died, Ralph has been under the care and feeding of his outspoken and controlling sister Rose, a feisty Lori Feldman, who manages his life from morning to night. Protective to a fault, Rose lives in fear that the events of October 25 will be repeated. She has been separated from her hubby Tony for over twenty years and feels she has taken the right road in not granting him a divorce. Cooking and cleaning for Ralph is her reason to live, and she is unwilling to move aside as this strange new woman threatens to usurp her role. 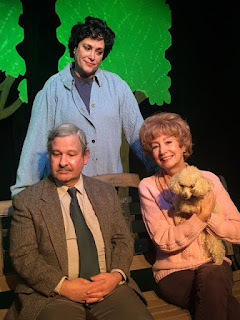 Meanwhile Carol, with her adorable four footed companion Peaches, a scene stealing Molly McMurray ( any resemblance to her owner Kris is strictly deliberate), initially resists Ralph's kidding and teasing ways. Ultimately his charm and wit win her over and they plan an exciting getaway. Rose, with a deliberateness that borders on meanness, threatens to spoil their last chance at happiness. Will Ralph and Carol find their heart's desire? Can Rose spoil their late in life hopes? Will Peaches be found in time? Kris McMurray directs this Valentine's Day old fashioned love note with sincerity and sweetness, with a quartet of talented actors leading the way. For tickets ($30), call the CT Cabaret Theatre, 31 Webster Square Road, Berlin at 860-829-1248 or online atwww.ctcabaret.com. Performances are Friday and Saturday night at 8 p.m., with doors opening at 7:15 p.m. Remember to bring goodies to share at your table or plan to buy dessert and drinks at the onsite concession stand. Come delight as Peaches plays Cupid to help Ralph and Carol prove that a second chance at love can be just as sweet as the first time around. Check to see if Peaches (or Molly to her friends and fans) gets her well deserved curtain call.